On January 16, 2001, Click2Asia bought A Magazine. The self-described largest global Asian online community and the nation's leading Asian American media company had combined forces to provide aMagazine's award-winning news, entertainment, style, and commentary, to Click2Asia's dynamic tools and features, to bold events that bring Asian America's brightest lights to you, like the "Bridge Builder" Asian American Leadership Awards and the Ammy Awards for Asian American Entertainment. In February 2002, aMedia, Inc. announced that it had ceased operations and aMagazine: Inside Asian America has discontinued publication. In addition, they are selling selling their domain (www.amedia.com). Started in a basement of a Brooklyn apartment building 13 years ago, aMagazine had been unprofitable since its inception. It was losing around $600,000 a year. The original vision was something akin to Time magazine for APAs. None of the founders took any pay, including Yang, who had the biggest stake and was even then the "driving visionary behind the magazine," she says. Funds for expenses such as printing costs were raised from friends and family, as well as throwing Asian-themed parties at New York nightclubs. Its annual list of the 25 most influential APAs - similar to the "New Establishment" list of media elite as anointed by Vanity Fair magazine, the magazine that aMagazine seemed most bent on emulating - was widely discussed. Otherwise, aMagazine tended to feature lightweight profiles of APA actors and authors, first-person pieces about Asian identity and fashion layouts with an artsy tilt. Since its inception in 1989, aMagazine was a vital and respected source of information for the Asian American community among other niche ethnic magazines like Korean Journal, AsianWeek and Filipinas. Bankrupt Asian Pacific American web portal site Click2Asia has shut down, taking long-running publication, aMagazine (see above). It failed to find a long-term strategy and failed to sufficiently click with web surfers and advertisers. Click2Asia was created in late 1999 out of the merger of two Asian-themed dot-coms founded in the mid 1990s: ABCFlash.com and Korealink.com. Flush with a $10 million round of venture capital money, Click2Asia kicked off 2000 with a memorable - and costly ad campaign featuring billboards of pop singer CoCo Lee in cities with high numbers of Asian Pacific Americans. Click2Asia's revenue was depended on income derived on beaming ads down to people in the "chat rooms." The disintegration of the Internet advertising market where like Yahoo! and Click2Asia were forced to practically give ads away materialized. Initial investors included Gareth Chang (former head of Asian broadcasting giant, Star TV), David Chu of clothing maker Nautica and John Tu of chipmaker Kingston Technology Co.
Racist attacks against Asian Americans spiked significantly nationwide after Sept. 11, claiming two lives and causing injuries to dozens more, according to a report released today by the National Asian Pacific American Legal Consortium. The study, "Backlash: When America Turned on Its Own," tracked 243 incidents in the three-month period after the terrorist attacks. By contrast, bias-based attacks against Asian Americans for typical 12-month periods number around 400, according to the report. "Unfortunately, some Americans have fallen into the grave misconception that all Arab Americans and Muslim Americans are terrorists, and therefore, anyone who even looks Arab or Muslim has become a potential target for violent retribution," the report reads. The study is a compilation of hate crime statistics provided by law enforcement agencies and supplemented by hate incident reports from individuals, community groups and media reports. The statistics were gathered by the consortium and its affiliates: the Asian Pacific American Legal Center, Asian Law Caucus and the Asian American Legal Defense and Education Fund. The consortium recommends that law enforcement step up its collection of data on hate crimes and urges the passage of a measure that would expand the federal hate crimes law, which would allow prosecutors to seek additional penalties for hate crimes in states that lack such laws. The study also recommends that the government and law enforcement officials provide diversity and sensitivity training to all employees. It also criticizes the U.S. Justice Department for interviewing and detaining thousands of Arab Americans, saying such practices arouse suspicion of wrongdoing. Nearly 80% of the incidents during the three-month period occurred in the first weeks after the attacks. Twenty-seven percent occurred in schools; 29% in the workplace, the study reported. A decade after the Manzanar relocation camp was named a national historic site, work is set to begin on a $5-million project to turn one of its last remaining buildings into a visitors center by 2003. The renovation is the most visible undertaking yet in a long effort to commemorate a dubious moment in U.S. history: the wartime roundup of Japanese Americans living on the West Coast. Manzanar's 10,000 inmates (of the total 120,000 Japanese Americans) were interned in a collection of wooden barracks thrown up on a barren piece of the Owens Valley 200 miles northeast of Los Angeles between 1942 to 1945 and the first camp to open. Most of the camp was dismantled after World War II. The large auditorium was left and used by Inyo County as a road maintenance facility. The unusually large photographic record of the camp, Toyo Miyatake's "up-close" shots, the discovered home movie of the camp and a call for camp artifacts and buildings will provide an accurate historical perspectives on view to the general public. BENJAMIN LUM passed away on January 1, 2002. This former teacher and actor was very active with the East West Players as an actor, Artistic Associate heading the Actors Network, teaching, and a member of the David Henry Hwang Writers Institute. Lum's TV series appearances include "Airwolf", "All-American Girl", "Bette", "Bodies of Evidence", "The Boys in Blue", "Buddy Faro", "Coach", "Chicago Sons", "ER", "Family Matters", "Goode Behavior", "Hawaii Five-O", "The Larry Sanders Show", "Married With Children", "Murder One", "The Nanny", "Paradise", "The Privateers", "Seinfeld", "Stalkings", "Sons of Thunder", "Star Trek: The Next Generation", and "Total Security". Lum's TV movie appearances include: "A Thousand Men and a Baby", "Freaky Friday", "The Innocent", "Hiroshima: Out of the Ashes". Samuel Mok is the first American of Asian descent to serve as chief financial officer of a Cabinet department. Mok was the managing member of Condor Consulting, LLC, a strategic management consulting company, his own consulting firm and chief executive officer at GL Associates. Mok was the first career chief financial officer and comptroller for the U.S. Treasury Department, appointed by former Treasury Secretary James Baker. While there, he implemented many management control programs to enhance financial reporting and control. Mok also served as a commissioned strategic intelligence officer in the U.S. Army, where his unit was awarded the Meritorious Unit Citation for outstanding performance. He is a certified internal auditor, a certified government financial manager and received the James Saylor Award for Outstanding Service from the Association of Government Accountants in Washington, D.C.
Mok graduated from Fordham University and received his master's degree in accounting from Catholic University in Washington, D.C. He is married to Nancy H. Sing Mok. Scott M. Sassa, the president of NBC's West Coast division, will leave his position in June 2002. Mr. Sassa's contract with NBC, a subsidiary of General Electric, expired in December. NBC and Mr. Sassa agreed to a short-term extension that would take him through the network's next program development season that traditionally ends in May when the networks announce their slate of programs for the fall television season. Mr. Sassa has been in charge of the business side of NBC's entertainment operations, based in Burbank, Calif. In that role he has been the lead negotiator for program deals like last spring's two-year renewal of the hit comedy "Frasier" and the current negotiations to retain the network's biggest hit, "Friends." He also led NBC's moves to create its own syndication division. Jerry Zucker, president of NBC Entertainment, will take over most of the entertainment-related duties. Despite reports to the contrary, sources have stated that a good working relationship was forged between Scott Sassa and Jerry Zucker. When NBC last year named Andrew Lack to a new position as president and chief operating officer of NBC, however, an additional level of management was created. Mr. Sassa had previously reported to Bob Wright, then the NBC president, who was elevated to the position of chairman of NBC at the time of Mr. Lack's appointment - whom Mr. Sassa has reported to him. Since Andrew Lack, who had been president of NBC News and has a background as a television news producer, has express his intentions to be active in NBC's entertainment operations, Sassa's role seem redundant. Mr. Sassa joined NBC in 1997 as president of its stations division. For a brief period he served as the president of entertainment under Don Ohlmeyer, who led the division as president of NBC West Coast. Previously, Mr. Sassa was the president of the Turner Entertainment Group at Turner Broadcasting. 1ST APA FILM ACQUISITION AT SUNDANCE! The picture sparked heated debate among viewers at its packed Jan. 16 screening in Park City due to its depiction of Asian-Americans as frustrated high school kids in a world that seems to force an overachiever identity upon them. ``Tomorrow'' uses crime film techniques to explore modern identity and cultural issues among some upper-middle-class kids. It was directed by Justin Lin. The cast includes the following: Parry Shen, Jason Tobin, John Cho, Sung Kang, Roger Fan and Karin Anna Cheung. Recently, the 9th Circuit Court of Appeals also ruled unconstitutional for denying bail hearing to immigrants held by INS while disputing deportation. The suit was brought by Hyung Joon Kim, a Korean citizen and a green card holder who was detained by the INS after serving three years in jail for petty crime. The ruling was binding in Alaska, Arizona, California, Hawaii, Idaho, Montano, Nevada, Oregon and Washington. Washington State Governor Gary Locke signed into law a bill that prohibits the use of the word "Oriental" on all state and local government statutes, codes, rules, regulations, and other official documents. The law takes effect on July 1, 2002. The bill (Engrossed Senate Bill 5954) was originally introduced on February 9, 2001. It was sponsored by Senator Paul Shin (D-21), currently the only Asian Pacific American incumbent in the Washington State Senate, among others. After July 1, the use of the term "Oriental" is prohibited. All state and local government statutes, codes, rules, regulations, and other official documents are required to use the term "Asian" when referring to persons of Asian descent. The bill also "urges all state and local entities to review their statutes, codes, rules, regulations, and other official documents and revise them to omit the use of the term 'Oriental' when referring to persons of Asian descent." Debate on the bill also sparked discussion on the definition of the term "minority business." Such businesses include those where at least fifty-one percent of which is owned by minority group members. The definition of minority now includes, but is not limited to, blacks, women, native Americans, Asians, Eskimos, Aleuts, and Hispanics. Tak Shindo, a recording artist, conductor and composer for a number of labels and entertainment companies, has died on April 17 in San Dimas CA at age 79. Tak Shindo was an A.S.C.A.P. recording artist for Mercury Records, Capitol Records, and Nippon Victor. He had amassed an extensive list of music credits which included film, radio, and television scores for 20th Century Fox, Warner Brothers, Columbia, Desilu, Disney, NBC, and CBS, as well as in Japan. He worked on such television series as the "Dinah Shore Show", "Wagon Train", "Gunsmoke", "The Untouchables", "It Takes a Thief", "M*A*S*H*", and "Hawaiian Eye". He served in the U.S. Army's Military Intelligence Service during World War II at Fort Snelling, Minnesota. He is survived by his wife Sachiko, his son Alan, two daughters, Janice Chang and Myra Shindo; a granddaughter, Tami Chang, and a sister, Shiz Nakazawa. To enhance homeland security and strengthen and control immigration, the Immigration and Naturalization Service (INS) implemented rule changes governing an alien's ability to begin a course of study and proposing significant changes to the rules governing the period of time visitors are permitted to remain in the United States. Additionally, INS is proposing procedures that would require an alien with a final order of removal to surrender to the Service within 30 days of the issuance of that order. Under the new proposed rule, aliens disregarding this duty will be prohibited from acquiring future immigration benefits. INS is forwarding all three rules to the Federal Register for publication and public comment. The interim rule prohibiting non-immigrants admitted in B visitor status from pursuing a course of study prior to obtaining approval of a change to student status takes effect immediately upon publication in the Federal Register. The change ensures that those aliens seeking to remain in the United States in student status will have received the appropriate security checks before beginning a course of study. deny discretionary relief to persons with a final order of removal who fail to surrender for removal within 30 days of the final order. 2002 Olympic bronze medallist Michelle Kwan has struck gold after all. The ice skater signed a three-year contract with The Walt Disney Company to serve as spokeswoman. She'll be featured in marketing campaigns for Disney theme parks, movies, and other properties. "Hughes as good as gold," "American outshines Kwan, Slutskaya in skating surprise"
Statement was made after Sarah Hughes won the Gold Medal at the 2002 Olympics. "The sub-headline, of course, implied that Kwan is not American. That hit the nerves of many Chinese Americans such as I, who, on more than one occasion, are perceived and treated as foreigners as if people with yellow skins can't be American." "The headline (that) implies that Kwan is not American is not just offensive, it's a complete breakdown in The Times' credibility as representing Seattle. This city's population is more than 13 percent Asian Pacific American." "After all the history (much of it agonizing) and contributions to the building of America by Chinese, particularly here in the Pacific Northwest, the only thing your headline writer perceives is that Michelle Kwan is some sort of foreigner or alien? A headline such as this serves only to reinforce the stereotype that people of color, no matter what we do, or how long our families have been American, or how much we contribute, will never really be 'American.' "
He was the unofficial spokesperson for "peer to peer" and Gnutella technology committed suicide. His technology accomplishments and milestones open the door to a vast myriad of possibilities. On February 1, 2002, Betty Muramoto passed away after a long battle with cancer. Betty Muramoto has been seen in many Asian American theatrical productions such East West Players (i.e. Threepenny Opera, 12th Night, Made in America, Pacific Overture, etc. ), Asian American Theater Company (i.e. 12-1-A, etc.) and many others. 911 Healing Hands, started by Cathay Bank, recognizes the efforts of APA's during the tragic September 11, 2001 tragedy. Merchants such as Sio Wai Sang's "Golden-Jade Jewelry, Spencer Chan's "Sweet-N-Tart snack shop, James Hom's Tai Hong Lau Restaurant, Jajie Hong's Shanghai Cuisine Restaurant, Kwong Kin-Tung's Chu Shing Import/Export (USA) Inc., Ellen Lii's TenRen's Tea Time, Paul Lee's 32nd Mott Street (the oldest store in NYC Chinatown that was established in 1891) and many others are losing a great deal of business since September 11, 2001. Traffic restrictions have contributed to declining business. While Canal Street, Chinatown's main roadway is open, some streets south of Canal remain closed and others are shut down without notice during the day. Chinatown's vibrancy, bargain restaurants and winding, crowded streets, has metamorphosed into a subdued community primarily serving its own residents with an economy that has suffered many setbacks. New York's Chinatown is the largest Chinese neighborhood in North America. The area dates to 1850 when Chinese immigrants settled in lower Manhattan, taking jobs as sailors and cooks. Today, Chinatown has about 300 restaurants, 100 grocery stores and 100 antiques and other shops. It has expanded north and east, swallowing sections of Little Italy and the lower East Side. The neighborhood is an ethnic center for the city's 787,000 Asian Americans, as well as a tourist destination. Only 2 APA Governors - Benjamin Cayetano from Hawaii & Gary Locke from Washington. 12 million Asian Pacific Americans have the purchasing power of $253 billion in 2001, up from $113 billion in 1990 -- the largest increase of any group. Asian Pacific Americans grew 48.3 percent from 6,908,638 to 10,242,998 in the 1990s. Asian American Republican vote fell from 46 percent to 39.2 percent, and the black vote from 14.1 percent to 10.6 percent. Since 1903, there have been 33 Members of Congress of Asian and Pacific Islander descent. New York State Governor George E. Pataki honored the efforts of Zack Zeng (who died in helping the injured during the September 11, 2001 tragedy) and Port Authority Police Officer David Lim, who saved hundreds of people who were trapped in a smoky stairwell. The agency found direct evidence of national origin (Korean) discrimination where the selecting official said that complainant would never be promoted because her accent made her too difficult to understand. The agency found no evidence that complainant's accent would have interfered with her ability to perform a Budget Analyst position. On appeal, the Commission found that the agency failed to meet its burden of showing, by clear and convincing evidence, that it would not have promoted complainant during the period at issue even absent discrimination. The Commission noted that the agency had ample opportunity to produce such evidence. EEOC noted that a mere assertion of a legitimate motive without additional evidence is insufficient in direct evidence cases such as this one. As part of relief provided to complainant in this case, the Commission ordered promotion with back pay. Stone v. Department of the Treasury (Bureau of Public Debt), EEOC Appeal No. 01A02572 (July 6, 2001), request to reconsider denied, EEOC Request No. 05A11013 (January 10, 2002). EEOC regulations make it illegal to deny an individual equal opportunity because of the "linguistic characteristics of a national origin group." See 29 C.F.R. 1606.1. EEOC has previously held that an employee's foreign accent can be used to take an adverse employment decision only when an employee's "foreign accent interferes materially with the job performance." Yuji Ichioka, a UCLA historian and community activist who coined the term "Asian American" in the late 1960s to advance the rationale for bringing diverse Asian groups together, has died of cancer in Los Angeles. He was 66. A founder of the UCLA Asian American Studies Center in 1969, Ichioka was considered by many to be the nation's foremost authority on Japanese American history. A man of many dimensions, the San Francisco-born scholar was known not only for his pursuit of social justice and research to recover the "buried past" of the early Japanese settlers, but also for his zest for life: playing basketball, eating, drinking and traveling. Ichioka mastered Japanese to tackle the original sources of immigrant life, such as diaries, letters and old newspapers. His seminal work, "Issei: The World of the First Generation Japanese Immigrants, 1885-1924," won the 1989 U.S. History Book Award of the National Assn. for Asian American Studies. Ichioka's contributions in compiling the Japanese American Research Project Collection at UCLA has made it the nation's largest and most significant historical archives on Japanese Americans. His many articles and two of his books, "A Buried Past" and "A Buried Past II," provided the foundation for Japanese American studies. In the 1960s, when people of Asian ancestry totaled fewer than 1 million, compared to nearly 11.9 million in the 2000 census, the idea of Chinese, Japanese, Filipinos and Koreans joining together for a shared political purpose was unheard of. And the proposition that Asians needed to forge an alliance with blacks, Latinos and Native Americans to work on a common agenda was even stranger. Ichioka created the first inter-ethnic pan-Asian American political group and coined the term "Asian American" to frame a new self-defining political lexicon. Before that, people of Asian ancestry were generally called Oriental or Asiatic. His role in creating the academic discipline was a logical outgrowth of his commitment to teach histories that weren't part of the mainstream curriculum. More than 120 years after the first Japanese immigrants came, Ichioka stands out as the researcher who documented and analyzed the Japanese American experience from the immigrants' perspective. He gathered his materials over many years by talking families into turning over from their garages and attics dusty trunks and boxes left by their ancestors. Ichioka's firsthand experience with racism influenced his outlook on social justice. His family was interned during World War II. He also lived among blacks in Berkeley, and picked fruit alongside Mexicans in the Central Valley. After undergraduate studies at UCLA, he earned a master's degree at UC Berkeley and did graduate work at Columbia, but decided not to pursue a doctorate because he thought it was a "waste of time." For 33 years, Ichioka was senior researcher at the Asian American Studies Center and an adjunct professor in the history department. In a modern-day "Alien Land Law" dispute in which the San Francisco YWCA claimed sole title to a historic building erected in the 1920s in the city's Japantown, Ichioka uncovered a crucial 80-year-old diary proving that the property was actually held in trust by the YWCA for the benefit of the Japanese American community. His research showed that the San Francisco YWCA merely held "paper title" to circumvent laws barring Asian immigrants from owning real estate, Tamaki said. Emma Gee was Ichioka's wife of more than 25 years. In addition to his wife, Ichioka is survived by his mother, Sei, and brothers Eddie and Victor, all of the San Francisco Bay Area; and sisters Pat S. Traylor of La Jolla and Yowko Richardson of Portland, Ore. Sponsored by representatives Peter Hoekstra (R-MI), Tom Davis (R-VA) and a bipartisan coalition of 30 House members, the resolution acknowledges the contributions and achievements of KAs over the past century. It also asks that the president issue a proclamation that U.S. citizens observe the centennial with appropriate ceremonies and programs. "Korean Americans have made many contributions to the United States and have had a lasting impact on their communities," stated Davis. "Hard work, strong families and cultural influence are just a few of the qualities that Korean Americans are known for, and continue to thrive today." On Saturday: September 28, 2002 - Hawaii Rep. 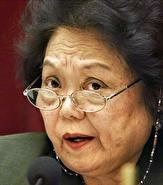 Patsy Takemoto Mink died at the age of 74 at Straub Clinic and Hospital. She had been since August 30 with viral pneumonia stemming from chickenpox. Her death came a week after she easily defeated little known perennial candidate Steve Tataii in the Sept. 21 primary election. She was the first Asian-American woman (and of color) elected to the U.S. Congress (House of Representatives). This Democrat accomplished this as a member of the House for 24 years over two different stretches. She was born in Maui in December 6, 1927. Her four grandparents emigrated from Japan in the late 1800's to work as contract laborers in Maui's sugar plantations in the search for a better life in America. While running for student body president at Maui High School, she faced the anti-Japanese-American sentiment that prevailed throughout the country during WWII and the obstacle of being the first girl to run for this office. She won this election by learning the importance of coalition building that will be seen throughout her political career. She began college at the University of Hawaii, but transferred to the University of Nebraska where she overturned their policy of segregated student housing. She returned to the University of Hawaii and graduated with a degree in zoology and chemistry. She decided to study law (since the medical schools she applied didn't accept women in 1948) and was accepted by the University of Chicago because they considered her a "foreign student." Choosing not to inform the University that Hawaii was an American territory, she obtained her Doctor of Jurisprudence in 1951. She was the first Asian-American woman to practice law in Hawaii. In 1956, she was elected to the Territorial House of Representatives. In 1965, Patsy Mink was elected to the U.S. House of Representatives and began the first of six consecutive terms in the House of Representatives. Mink became part of a movement, mostly composed of second-generation Japanese-Americans many of them decorated World War II veterans that enabled Democrats to wrest control of Hawaii politics from Republicans in 1954. Mink was one of Hawaii's most liberal politicians, often working outside the mainstream of the Democratic Party. She supported women's rights, was against the death penalty and had as her spending priorities were education, housing and health. Mink believed one of her most significant accomplishments in Congress was Title IX of the Education Act, which she helped author in 1972. It mandated gender equality in any education program or activity receiving federal financial assistance. The law promotes equality in school athletics. Scholarship money for women increased from $100,000 in 1972 to $179 million in 1997 but was equally important in opening academics. After serving in the territorial and state legislatures, Mink was initially elected to Congress in 1964. She remained in the House until 1976. She returned to politics from 1982 to her death. She is survived by her husband, John Mink, and daughter, Wendy. Copyright © 1996-2005 - Asian American Artistry - All Rights Reserved.